Most biographers of Luther are faced with a choice-focus on Luther's life or focus on his thought. The choice, though real, is false. Luther's thought was inextricably bound up with his life. In this short, engaging volume, Hans Schwarz succeeds in blending the two-creating a volume that introduces Luther's thought in the context of his life story. 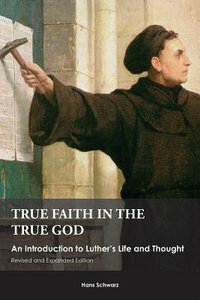 The book meets the need for a clear and concise introduction to the life and teachings of the great church reformer, Martin Luther. After a brief overview of his life, the book devotes chapters to Luther's thoughts on key areas of the Christian faith and life, including the knowledge of God, church and sacraments, the Scriptures, marriage and parenthood, and vocation. The author incorporates quotations from Luther's own writings to show how Luther's insights have relevance for all Christians today. With questions for reflection and discussion, the book can be used as a study resource for individuals, church groups, or college and seminary classes. For this revised edition, Schwarz has thoroughly reviewed the text and added important new sections on Luther and music, Luther and the economy, Luther and the Jews, and more. About "True Faith in the True God (And Expanded Edition)"
Schwarz is Professor of Protestant theology and director of the Institute of Protestant Theology at the University of Regensburg.